There’s a persistent discussion going on for a long time if shooting architecture or other art structures like sculptures can be called fine-art, as it is derivative of the original architectural creation and is actually plagiarism because you take an original work of art, the architectural creation, and then photograph it. My premise and conclusion are, that it is not derivative and that the object captured doesn’t determine the artistic value of a photograph or painting. Ever since I focused on architectural photography in roughly the last 9 years, there have been a few occasions that I came across individuals who either commented on my mostly architectural work, or else on someone else’s architectural photographs saying something that all came down to the following: photographing architecture or other art structures like sculptures cannot be called fine-art as it is derivative of the original artistic creation of the architect. On top of it, they claim: it is actually plagiarism because you take an original work of art, the architectural creation, and then photograph it. That photograph is not an original creation anymore but derivative and plagiarism. And surely, it can never be called fine art. The same applies to taking photos of sculptures. Now someone’s personal negative opinion usually isn’t something I’d worry about. But those assertions were very serious and of such nature, related to our day and age of the Internet where emulating an artist’s work isn’t being frowned upon anymore, that I believe it needs a rational and serious response. Photography and visual arts in the age of the internet and Social media with the very liberal attitude towards intellectual rights and appropriation of such rights, has become too liberal in my view. When anyone can emulate someone’s work almost literally and it is widely expected from the original artist that he/she should take it as a compliment, while at the same time it is also a legitimate response to call a photo of another artwork, plagiarism and not fine-art, then I believe the world of photography has lost its way, and perhaps its mind. In this article I won’t go into the issue of legitimate or illegitimate appropriation of intellectual rights, as that is too complicated and deserves an entirely different discussion, but I will only go into the question whether taking photos or creating paintings and drawings from existing creations such as buildings or sculptures is plagiarism and if it’s a valid observation to not call them art. There are two assertions that will be discussed separately and in conjunction. 1. A photo of another existing work of art, such as a building that is the artistic creation of an architect or a sculpture which is the artistic creation of the sculptor, is plagiarism. 2. Such a photo cannot be called fine-art or art as it is a derivative. Before going into these the following needs to be clear: plagiarism is an ethical issue and infringement, and is not directly or always a legal issue. But the identification of plagiarism can also indicate a copyright infringement, which is a legal issue. So when someone accuses you of plagiarism it is often meant as an expression of ethical wrongdoing. As a universal principle in modern society, an ethical or moral wrongdoing is often covered by a specific legal regulation, in which case, legal consequences can be a result. On the other hand, if there’s no legal regulation of an alleged moral or ethical wrongdoing, then this is an indication that society doesn’t consider it an ethical or moral wrongdoing. In other words: there’s a possibility someone accusing you of plagiarism will also find a law that has been infringed, hence, if there’s NOT such a law or even better, if there IS a law that specifically protects you from any alleged wrong conduct, then it’s likely not an ethical wrongdoing. 1. Taking a photograph of another existing creation or work of art, like an architectural structure or a sculpture is plagiarism. First a definition of plagiarism. The Oxford dictionary says ‘The practice of taking someone else’s work or ideas and passing them off as one’s own’. 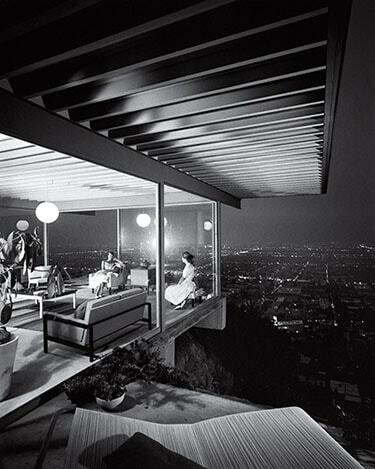 My premise: a photograph of a building can never be considered plagiarising the work of architects. Why not? Firstly, when looking at the definitions then the clue is in representing it as ’one’s own original work’ and in ‘passing ideas off as one’s own’. When I take a photo of a building, then I’m not representing the building as if I built it myself. It’s clear I didn’t, it’s clear I don’t take credit for building it, even without mentioning the architect. What’s only clear is that I took a photograph of it, and the photograph is mine, there’s no misunderstanding there. Secondly, it cannot be plagiarism, because the expression of the architect, the building, and the photographer’s expression, a photo of that building, are entirely different mediums. If I would take a photo of a beautiful book, am I plagiarising the writer? It seems obvious to say ‘no of course not’ because it is clear here that the medium of expression is different, as is my message. The true art of the writer is in its content: the writing itself, not the physical book. The photo I took of the book is not the writing, it is an impression of the medium the writer used. My photo is two-dimensional and is just a slice out of an objective reality that has a specific meaning that is totally different from the meaning of the writing in the book. Even if I took a photo of all the pages of the book, so anyone could read the book by looking at my photos, it still is not plagiarism if it is clear I only wanted to take photos of the entire book and I didn’t pass off the writing in the book as if I wrote it. Of course, you will run the risk of being sued by the author of the book since the author most likely has prohibited copying and distributing the content or parts of the content of the book. But that’s a different (legal) matter and not plagiarism. The same applies to a photo of a building: the photo doesn’t take up three-dimensional space in a specific location where people can live or work. Where people can drive over, through or under it, but it is only meant to be viewed in a two-dimensional space where you cannot live, work, fly over, or drive under. The building and the photo of a building have entirely different purposes as they are different mediums with different intentions. So to say you’re plagiarising an architect is for that reason only an absurd and far-fetched assertion. 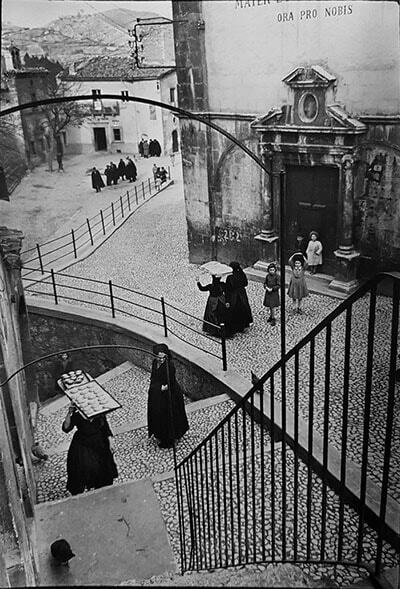 Would street photographer Henri Cartier-Bresson be a plagiarist because in many of his photos buildings form the background of his candid shots? And no, they’re not just there by accident, Bresson’s photos have the power they have because geometrical shapes (of buildings and shadows for example) are an important part of his work. 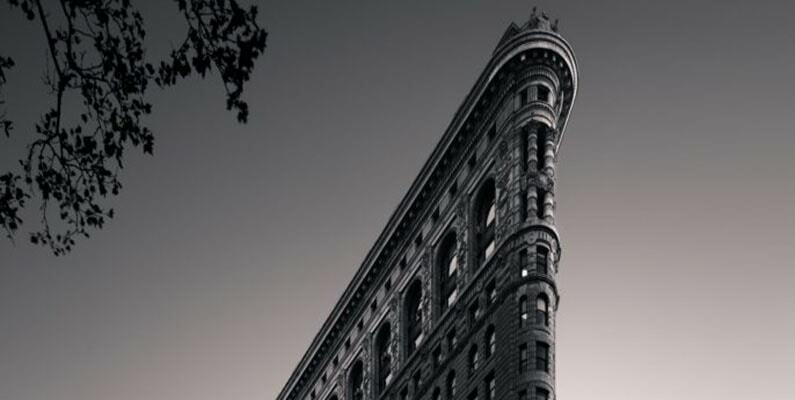 Or would the spiritual fathers of fine-art photography Edward Steichen and Alfred Stieglitz be considered plagiarists because both of them have photographed the Flatiron Building in New York? 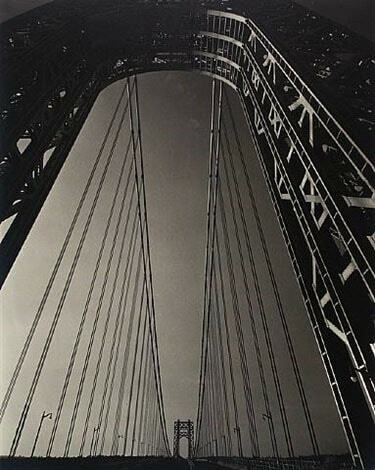 Both took many photographs of other buildings and bridges like Steichen’s George Washington Bridge photo. 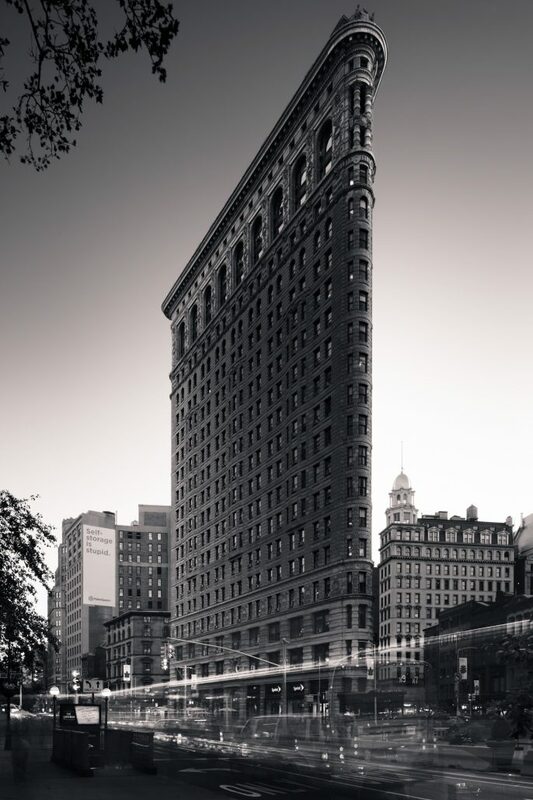 The Flatiron by Steichen is probably the most famous fine art photo of architecture of the last 100 years, together with Julius Shulman’s Case Study House no 22. 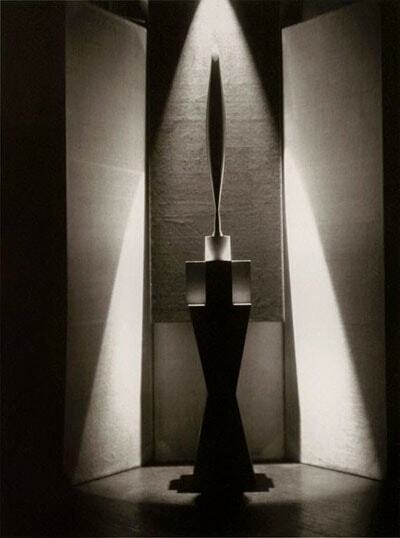 Steichen even photographed a sculpture by sculptor Brancusi, titled Bird in Space. And there are many more examples of renowned fine-art photographers in whose work architecture and other art objects were the main subject matter. Hiroshi Sugimoto who photographed the Disney Centre in Los Angeles and many art objects and sculptures is another important example. No art critic would deny the artistry of the masters mentioned here. 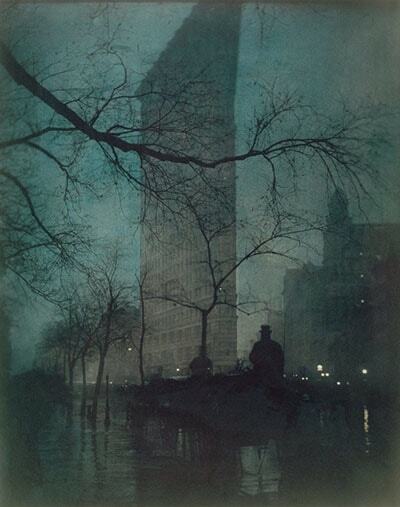 The work of Steichen and Stieglitz is in the permanent collection of renowned museums. Still, even if you would consider it plagiarism, then where do you draw the line? Is it only plagiarism because it is a beautiful and well-known building? And not when it is just any random building or for that matter any other object? Is it only plagiarism because you took a photo of a creation that is considered art and not when you took a photo of a creation that is not considered art? That is a double standard. It is plagiarism because you ‘pass off ideas as if it were your own’ or it isn’t. You can’t make a separation between famous and not so famous buildings. Thirdly, the majority of European countries have a so-called ‘Freedom of panorama’, which basically entails that no owner of a building or a sculpture or other 3-dimensional objects, nor the architect or any other designer of it, can include the taking of photographs, or other visual depictions like paintings or drawings of a building as an infringement of their copyrights, when the building or sculpture is publicly visible. Also, the USA, Canada, and Australia have similar ‘Freedom of panorama’ laws that will protect the photographer or painter of a building from being prosecuted for copyright infringement. Earlier I’ve already stated that there’s a difference between plagiarism, which is an ethical qualification, and copyright infringement, which is a legal qualification. Consequently, despite the exclusion of intellectual property infringement by Freedom of panorama regulations, it can still be plagiarism. Or not? As I stated earlier: usually an ethical or moral infringement is also covered by law and punishable by law. A universal principle is that when behavior is punishable by law, it is only because the behavior is also an ethical, moral or social-economic infringement. And if a behavior is not punishable by law, it usually means it is also not an ethical or moral infringement. In other words, there’s a very rational and socially acceptable and imposed reason why there is a Freedom of panorama, and it is not an arbitrary reason just to exclude image-makers. But simply because it is generally accepted that creating an image of a building that is publicly visible is not considered plagiarism and is not an ethical infringement. Hence, taking a photo of an existing creation or work of art, is not plagiarism. 2. Such a photo cannot be called art or fine-art. Why not? Suppose the asserter of that would agree it isn’t plagiarism but would state that since you took a photo of something that is already an artistic creation in itself, it cannot be art. I can’t see any logic behind this type of reasoning, perhaps because the asserter has a wrong idea on what art in photography is and/or he makes the wrong conclusion. So we have to answer the question what is art in photography? Preceding this question is the question, what is art? I don’t pretend to have the definitive answer to that but I, for example, think of art as a way of expressing what it means to live, to be alive, what it means to feel as a human being. And to express that, anything is allowed, any medium is allowed. Aesthetics play an important role in that, as it is the form in which your expression is shaped. So, art in my view is a meaningful expression of the human condition through a medium in an aesthetic form. Now, what is art in photography? The asserter stated that since it is a photo of an existing artistic creation it is not art. So basically he states that there is a direct relationship between the object that has been photographed and the artistic value of that photo. If the photographed object is already art, then the photo is not art per definition, and if the object is not art, then yes, it could be art but not always. That’s, to say the least, a very unconvincing and arbitrary view on fine-art photography or art in general. It is not the object in a visual expression like a photo, that defines if something is art, but it is the intention behind a visual creation that defines if it is art or not. The object in the frame has nothing to with it and at best can only give a clue about the intention behind a photo or painting. If there’s a direct relationship between object, art, and intention, then where leaves this abstract art where there’s no concrete object at all? No object, so, no art? Or no object, so, yes it is art? It all becomes a very arbitrary and biased construct only meant to suit one’s restricted views. And besides, if the object would be the defining criterion, then this opens the door to obscure discussions whether the object in the frame is art or not. Stieglitz talked about equivalents as a concept that defines fine-art photography. What does he mean by that? In a nutshell: he says that objects in photos, whether they’re trees, clouds, buildings, nudes or flowers, are only used in a symbolic way if they’re to be considered art photographs. When Stieglitz showed a series of clouds, those series weren’t meant to be a meteorological and literal study of clouds. In fact, they have nothing to do with clouds. Clouds were just a symbol through which he could effectively communicate an emotion, a feeling. Objects in fine-art photographs are often not used in a literal way. The same applies to the fine-art architecture photos I am creating: the buildings are just objects, symbolic objects that suit my need for expressing a specific idea/emotion. I don’t care about how the building I photograph is intended by the architect and how it should be shown, unless the architect would commission me to shoot his creation. In that case, I’m just a real estate or commercial architectural photographer, not a fine-art photographer. More on this in my article. In other words: when shooting fine-art photos, I use a building not to glorify the creation of the architect, but to glorify my impression of the building and how it has an aesthetic and symbolic place within my artistic concept. 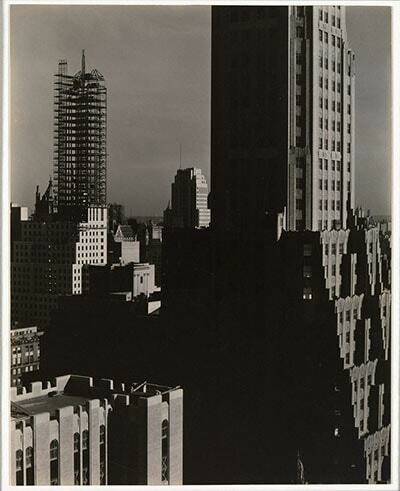 That is why Steichen’s photos of the Flatiron building, the Empire State Building and George Washington Bridge are rightly considered to be art. That is why Sugimoto’s photos of other 3-dimensional artistic creations and the Disney Center in Los Angeles are considered art. That is why the paintings of Dutch and Flemish master painters of churches and church interiors are considered art. The artistic value of the object in a photo or painting, or the presence of any object in a painting, drawing or photo doesn’t determine the artistic value of the visual expression that depicts the object. Only the intention of the artist. My article on fine-art photography on this website. Architectural photography – real estate vs fine-art. More info on Freedom of Panorama can be found here (PDF file). Unrelated but there’s a continuous discount of 10% off of all Formatt-Hitech filters and accessories, at checkout with the discount code: BWVISION10. Think about this way if the architect didn’t make the building the photographer wouldn’t have any subject. Also the architect would not need the photographer to build but the photographer would need the architect to click. So in my opinion taking a photo of building and commercialising it is plagarism. That’s nonsense. If the architect didn’t design the building then a photographer would still have an infinite amount of objects and subjects to photograph, THAT building surely isn’t the only thing in this universe to photograph. So no, I or any other photographer, don’t need the architect to create photographs. I can create photographs of anything, a cloud, the moon, people and other manmade structures including buildings, I do not need an architect to call myself a photographer and make a photo. If you read the article with more than just superficial attention it would be clear that plagiarism is an ethical qualification that in this case is not covered by the law. One should then ask the question if it’s still an ethical qualification or a very subjective qualification, restricted by personal, subjective and perhaps impaired views on what art is or should be. Fantastically written article Joel! I couldn’t agree with you more about some of the concerns being raised here with regard to intellectual property, plagiarism and copyright infringement in photography. One of the things that frustrates me is that there is so much confusion and lack of clarity on intellectual property rights etc., that many self appointed enforcers are preventing photographers and artists from expressing themselves, without really knowing why? We have situations now were public buildings that have become ‘popular’ with photographers and artists are becoming off limits with over zealous security guards and threats of copyright infringement (Eiffel Tower lights). The whole thing has become ludicrous. If no one visited these ‘popular’ landmarks, famous buildings, statues etc., they would be begging you to come and take pictures. I’m guessing that one of the reasons why all these ‘infringement of intellectual property threats’ have increased over the years is that many of these popular attractions want to sell their own tacky tourist memorabilia to the public, rather than let an artist with his/her own vision present their work to the public. The art is in the artist not the object and this is what people want and will pay for! Simply said I can not nor do I want to imagine a life without photographs of the people and buildings of such places as N.Y.C., New Orleans, Chicago, L.A. And on and on. Architectural photography can be breath taking given the right lighting and composition does always look that way, no. So that that make the photograph unique in its self, I feel it does, so can it be fine art ? I can not see why it can not. As for people in public places doing public acts for all to see… Well that is why there are laws in place concerning entitlement to privacy. You can not run around the block naked and expect no one to notice. If you step into my photograph I may not be any happier about than you are. On the other hand perhaps it will add something needed. It is a matter of the photographers personal choice. Art like beauty is in the eye of the beholder. This article addresses an exciting but also confusing topic. You discussed and substantiated it brilliantly, and I agree with your statement. Fantastic, Joel! Deep Thoughts Joel. I would like to take a step back in time. During the 1970’s Petersen’s Photographic Magazine was obsessed with the higher morality of street photography i.e., photographing people without their permission. When you mentioned, “Would street photographer Henri Cartier-Bresson be a plagiarist because in many of his photos buildings form the background of his candid shots.” Today I think it a greater injustice is to photograph a person(s) without their knowledge than to concern myself about the building(s) in the background. The media made such a big deal of the NSA eavesdropping and authorities photographing without our knowledge, “Our rights are being violated.” While at the same time, those same people are out on the streets taking liberties of photographing anyone and anything. Secondly, the architect in my opinion creates for two reasons: 1.) socioeconomic for himself, for the community, the communities stature, and its people to create jobs, etc. 2.) for the architect’s passion to create and sustain their posterity for all to admire their creation for future generations. I dare say that there isn’t an architect out there who would not be thrilled to have his/her creation showcased in a magazine, gallery, the halls within the building and in social media. So am I plagiarizing when I create through my own eyes, I say no. I am trapped in the moment surrounded by the enormity, the lines, the shadows, the highlights, the mystery at street level and around the next corner. The visual art is expressed through my eyes coming from my soul. Lastly back in the days before the digital darkroom the majority of the people did not have their own darkroom. We took the film to a developer and they created for us. Did the developer plagiarize? Now that the playing field has been leveled we create ourselves. We have a choice, to duplicate what the camera sees with some minor global changes or to interpret our visual feelings, the silence of the moment on God’s earth, or the cacophony in the streets surrounded by huge urban monoliths for us to admire and to showcase our work by way of our creative vision which makes a statement, God you done good and to the architect thank you for sharing your gift that you created. I agree with you Joel I create art through my own personal interpretation and choose to call it art. Thanks Richard, good thoughts and observations. I think there should be a discussion on what’s allowed and appropriate in street photography. I think that with the advent of digital cameras and phones with a built-in camera (it’s estimated that around 4 billion people have a phone with camera! ), photography has become ubiquitous now. But not only that: not so long ago, but not longer than 17 years ago, we kept those photos to ourselves. If one’s portrait was taken on the street, it largely remained private. Now we can post these photos on Instagram or Facebook for the whole world to see. I think this requires a serious discussion on what the new ‘etiquette’ should be and what we should tolerate and at the same time what we should be willing to give away in terms of privacy. And that’s no easy discussion. A related discussion is how to deal with real plagiarism where the intention of an artist is literally copied. Also something that has become ubiquitous in this era of the Internet and digital photography. But with 4 billion people having a camera (and increasing) and also with an increasing access to social media for everyone, how do we determine and know what the original source is? How do we determine if something is a derivative of something else? Sometimes it’s obvious, but in the majority of cases it is not obvious. My feeling right now is that we have to tolerate more and can claim less. All aspects that I want to discuss in future articles here. This is absolutely SPOT ON, my friend. Thank you so much for publishing this and making such a wonderful written record of this line of thinking, of doing, and of acting. Nicely written and expressed! Cheers! Many thanks Kevin – more similar blogposts to come related to plagiarism and the dramatically changed world in the Internet era. My premise: with the increasing number of people owning a phone with camera (4 billion) and people owning digital cameras, we can claim less and have to tolerate more. But to what extent and how to determine the criteria? I think that’s a serious question and a very difficult discussion. Interesting reflection Joel and I agree totally with Giulo. To the detractors of Fine Art photography or Fine Art spirit I advise to go and photograph the void, of which they are specialists. Although even Im atheist , I dare this remark, when you photograph a landscape is it a plagiarism of God? Critics may also review the history of art in which talent or masterpieces have often outdone the destructive criticisms of an innovative trend. Like Walter Benjamin, they must asked themselves the right question:”We had spent ourselves in vain subtleties to decide whether or not photography should be an art, but we had not asked ourselves whether this invention even did not transform the general character of art. It would be really interesting to know the opinion of some architects if they could see the photographic and artistic interpretation of their works…. Some of my friends only see concrete, glass and steel in a building. As far as I am concerned, I often see, not always, an extraordinary work that generates emotions, creates a story and asks lots of questions. Indeed, how can we doubt that, for example, the Arche de la Défense, the Pyramid of the Louvre are not modern temples that send us back into the history of the world, how can we deny that a sky craper is also a symbolic relationship between earth and sky? Its not so easy to propose his own vision in an artistic way, but if this work generates an emotion, thats one of the prove that art and photography are closely linked. PS: Thanks to Zaha Hadid, Herzog and De Meuron, Gehry and so many others they make us dream more than the four pixel cutters. Spot on Philippe and couldn’t agree more! We have to tolerate more and claim less – but to what extent? Very interesting reflection Joel. I would take a further step back. A photograph is a reproduction of something that exists at the time when the photograph is taken. The subject could be nature, living beings or a man made creations. The approach to photography is determined by the photographer. It could be a simple recording of the subject or it could be taken in order to be further artistically elaborated, as it is the case in fine art photography. In fine art photography the subject is deprived of its original meaning and it becomes the basis for the photographer’s abstraction, a new meaning is attributed by the photographer according to his/her vision. In this respect, I don’t consider man made creations more susceptible to plagiarism than nature and living beings. Actually, I believe that by attributing new meanings to other men’s creations we actually empower those works of art and contribute to their constant rebirth. On the other hand, emulating other photographer’s work without any personal vision, it becomes a dry exercise. Amen. Completely agree with you and couldn’t have said it any better.